DiCaprio on his screen fights with Winslet: "I relished those sequences"
LONDON, England (CNN) -- Leonardo DiCaprio says he couldn't wait to clash with Kate Winslet on the big screen. Kate Winslet and Leonardo DiCaprio reunite in "Revolutionary Road." "I relished those sequences. Those were some of my favorite scenes to do," DiCaprio says about the emotional sparring between the two in their latest movie "Revolutionary Road." More than a decade since pairing up in "Titanic," DiCaprio and Winslet -- one of Hollywood's most iconic, not to mention, bankable, screen couples -- are back together. 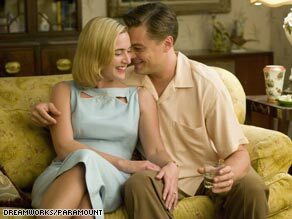 A portrait of an unhappy marriage that falls to pieces, "Revolutionary Road" won favorable reviews from critics, although it was largely shut out of the Oscars. The emotionally fraught film, for which Winslet earned a Golden Globe, only earned one major Oscar nod -- a best supporting actor nomination for Michael Shannon's portrayal of a mental patient. Based on Richard Yates's 1961 novel, DiCaprio and Winslet play Frank and April Wheeler, a Connecticut couple who struggle to escape the confines of 1950s suburbia but ultimately fail in their attempt to live more purposeful lives. After the success of "Titanic," the highest grossing movie ever, the duo remained close and wanted to work together again. But they didn't want to do anything similar to what they'd done in the past, according to DiCaprio. "We fundamentally knew that if we were going to do something together again, we didn't want to tread on any type of similar territory," he explains to reporters while promoting the movie. "We just knew it would be a fundamental mistake to try to repeat any of those themes." If "Titanic" was about love defying all odds, "Revolutionary Road" charts a relationship that disintegrates despite the desperate attempts made to hold it together. And that, according to DiCaprio, is what made it a perfect project. After reading the script by Justin Haythe, Winslet suggested her husband Mendes, who took home an Oscar in 2000 for "American Beauty," direct. Once he was on board, she approached DiCaprio about getting involved. DiCaprio says he knew he and Winslet would be able to draw out the best performances in each other -- particularly in the scenes that called for them to come head to head. "Knowing Kate for such a long period of time, I knew that we could take advantage of our friendship and our relationship on a personal level for those scenes," he says. "So much of what happens between Frank and April in this film is what's left unsaid. I actually found it a real joy to do those fight scenes because finally, these people were letting each other have it." Shot in the suburbs of Connecticut, the cast spent weeks before production hammering out the intricacies of their characters. Filming the movie in sequence -- which director Mendes insisted upon -- also gave the actors a rare opportunity to delve deeply into their roles. Did working with a husband-and-wife team pose any problems? Not at all, DiCaprio says. Mendes purposefully hung back at times, and was conscious DiCaprio and Winslet needed to develop their own relationship on set. In fact, the dynamic was beyond comfortable, he recalls. It was like he was "at their little bed and breakfast making a movie." While the movie is set in the 1950s, it is relevant today, DiCaprio explains. Most people can identify with the desire the Wheelers have to live the life they dreamed of living -- and the challenges they face when they try to break free. "There's rarely a movie nowadays about people and their normal struggles to find happiness in their life, and that's what this movie is about."